There’s a big land-buying frenzy happening in Asia right now. But you won’t hear about it in the news. It’s the same kind of buying spree that took place in Beijing in 2003, shortly after the city won its bid to host the 2008 Olympics. That set off a bull market in Beijing that sent property prices up 400 percent between 2002 and 2010. This time around, it’s quietly happening in the Greater Bay Area (GBA) Initiative – a special economic region comprised of nine municipalities in China’s Guangdong province, as well as Hong Kong and Macau. The region has 69 million people and an economy as large as that of Russia – the world’s 12th largest economy. Plus, we’re also giving a “sneak peek” at three top picks to buy now. The point of the GBA Initiative is to create a single, giant economic hub, and to make Shenzhen – China’s technology centre – like the Silicon Valley in the San Francisco Bay Area. Only the GBA Initiative is three times the size of the San Francisco Bay Area. It’s a huge market filled with high-income, high-spending consumers. And they’ll be connected by a complex web of road, air and railway infrastructure, as well as an ultra-fast mobile communications network, speeding up the pace of doing business. So far, most of the development in the Greater Bay Area has been centered around four key regions: Hong Kong, Macau, Guangzhou and Shenzhen. According to investment bank DBS, real estate prices in Guangzhou have nearly quadrupled since 2006. Prices in Shenzhen have risen more than fivefold, while prices in Hong Kong have gained nearly 300 percent. Over the past year, China’s biggest property developers have spent US$16.2 billion buying 15 million square metres of real estate in the nine municipalities that are part of the GBA. These are the smaller cities that have been largely left out of the property boom. That works out to about US$1,080 per square metre for an area that’s four times as large as Central Park in Manhattan. About one-third of all the land bought by these developers is in Foshan, a city that’s 175 kilometres northeast of Hong Kong, with a GDP just one-third that of Guangzhou or Shenzhen. Just six months ago, traveling from Hong Kong to Foshan involved a three-hour bus ride (plus a lengthy wait to get through border immigration). But in September, the Guangzhou-Shenzhen-Hong Kong Express Rail Link opened. This bullet-train service travels at speeds averaging 200 kilometres per hour, and cuts the travel time between Hong Kong and Guangzhou from three hours to just 50 minutes. From there, travelers can take a second line to Foshan that will take an additional 20 minutes. This has helped turned Foshan, a once-sleepy manufacturing hub for air conditioners and refrigerators, into a bustling and modern city filled with skyscrapers, shopping malls and apartment buildings. It’s now an alternative home for millions of people who can no longer afford to live in Shenzhen and Guangzhou. In 2017, approximately 150,000 people moved into Foshan. That created demand for 50,000 new homes – equivalent to 125 forty-story buildings. The same is happening in smaller GBA cities like Zhaoqing and Jiangmen, where real estate is in greater supply and they’re now easier to get to because of better roads and railway infrastructure. 1000x faster, 1000x more capacity, plus the power to download a 2-and-a-half hour movie in one second. Get positioned soon, and you could pocket a sweet $150k profit. Free demo here. The cost of property in cities like Foshan, Zhaoqing and Jiangmen is a fraction of the prices in Shenzhen, Guangzhou and Hong Kong. In Foshan, for instance, the average price per square metre for an apartment is 13,000 yuan (about US$1,900). Guangzhou prices range between US$4,030 and US$7,900 per square metre, while Shenzhen prices range between US$7,100 and US$13,300. But thanks to the GBA Initiative, prices in these smaller cities are catching up – fast. Foshan property prices, for instance, climbed 35 percent from July 2017 to December 2018. Zhaoqing and Jiangmen property prices were up 24 percent and 20 percent, respectively, over the same period. But because prices in these cities are still relatively cheap, there’s plenty of room for further increases, as the population in these cities swell. That’s why we’re seeing such a frenzy of buying GBA real estate. Does this mean that China’s property market is becoming a bubble again? As I’ve written previously, Beijing has been imposing measures to slow down the real estate market, especially in cities where prices have become prohibitively expensive. These measures include selling price limits, higher down-payment requirements, as well as restrictions on how real estate developers can raise and use money. Those measures are still in effect in most major cities in China. So don’t expect the overall property market to turn red-hot again anytime soon. According to Reuters, China’s average residential property prices are forecast to rise 2 percent in the first half of 2019 from a year earlier, and just 0.5 percent for the full year. But there will be opportunities to invest in what’s becoming the biggest land-buying frenzy of the century. This includes real estate developers with significant exposure to the Greater Bay Area market, as well as construction companies and mass transit system and toll road operators. It also includes companies able to serve up demand for everything from banking to food services. Remember, there are still 600 million Chinese living in the countryside, or nearly half of the population. That’s nearly double the size of the U.S. population. Many of them will want to move to the Greater Bay Area in the same way that Americans want to live in New York and San Francisco, and Japanese want to live in Tokyo. While there are no specific exchange-traded funds (ETFs) dedicated to finding opportunities in the Greater Bay Area Initiative, investing in a fund of China’s biggest corporations – which are likely to have substantial stakes in this new economic region – can be a proxy for the GBA. These include the iShares China Large-Cap ETF (Exchange: New York; ticker: FXI) and the SPDR S&P China ETF (Exchange: New York; ticker: GXC). P.S. I recently launched a brand-new trading service that’s designed to help readers like you make the most of the growth that’s unfolding in Asia. It’s called Extreme Growth Trader, and it’s specifically designed to pinpoint massive, quick-profit trading opportunities in a small corner of the NYSE overlooked by most investors. These are opportunities for gains of as high as 617 percent in just months. You can learn more about Extreme Growth Trader right here. Compared to a generation ago, China’s economy is unrecognizable. And in another 20 years, it will have totally changed again. For starters… it used to be that cheap labour was a centerpiece of China’s economic growth. I remember traveling to the Canton Trade Fair in the early 2000s. It was the biggest trade fair showcasing just about everything that Chinese companies could manufacture at a lower cost than anyone else. Stuffed dolls, plates, Christmas decorations, wooden furniture and countless other household items were on display in a building the size of 10 football fields. There were lots of “Made in China” knickknacks… but there were no coffee shops close to my hotel in Guangzhou. The restaurant there featured bad service – and no English-language menus. There were no glitzy shopping malls or supermarkets within walking distance of the hotel, and no convenience store for a late-night snack. 15 years later, it’s a different place. Click here for details on a brand new way to invest in gold. China’s labour is no longer cheap. Minimum wages have been rising nearly 10 percent a year in the biggest cities. At US$3,700 to US$4,200, annual minimum wages in Beijing and Shanghai, respectively, are two to three times those of Indonesia (US$1,304) and Vietnam (US$1,526). And the country’s economy has been undergoing a seismic structural shift, from being largely focused on manufacturing for export – to focusing on services (everything from education to entertainment). These are the industries that support higher wages. That evolution is clear on the street. While I was in Beijing last month, I stopped for coffee at Starbucks, wandered the malls along the Wangfujing shopping district and grabbed some snacks for my 14-year-old son at the JD.com convenience store right around the corner from my hotel. I also came across a different kind of change… one that doesn’t usually feature in investment theses or financial models, but which reflects other, also seismic, evolutions: Clean public bathrooms. Ask anyone who went to China in the 1990s about their worst experience, and you’ll probably hear about epically dirty bathrooms. When I was in my late teens, I traveled to China near the border with Hong Kong several times. I’ll spare you the details, but the bathrooms at the Lo-Wu border customs and immigration office were memorably gross. This sign in a public toilet in Harbin is part of the government’s ongoing effort to educate its citizens on the importance of maintaining cleanliness. Hong Kong could do with a few more public toilets. But there are so many malls and hotels in the city, you don’t have difficulty finding a clean bathroom to use at any time of the day. This makes it a pleasure to travel within the city. It’s one of the reasons why tourism is thriving in these two countries. Tourism and travel are responsible for 17 percent of Hong Kong’s GDP. In China, it’s only 11 percent. In Singapore, it’s 10 percent, while the industry accounts for 15 percent of Malaysia’s economy. Last year, tourism added US$580 billion to China’s economy – about 5 percent of GDP. But it could reach US$1.1 trillion if it reached the same level of contribution as Singapore. To promote domestic and international tourism in China, in 2015 President Xi Jinping announced a US$3 billion “toilet revolution” throughout the nation’s cities and popular destinations. A total of 68,000 public toilets have been refurbished, or built from scratch. In some cities that are popular with tourists, such as Beijing, Haikou and Taiyuan, nicer public restrooms have been built. They function more like rest areas, offering bank ATMs, snack machines, Wi-Fi and recharging stations for mobile phones. But they’re only half done. Another 64,000 will be refurbished or built over the next two years. ATTENTION: Thousands of Our Readers Have Been Flagged! You could be one of them. What does that mean? Our customer care director has recorded an urgent video to explain everything. Click here to watch this important message before Monday night. This is urgent! You’ll understand why once you click here and see our director’s message. New, and clean, toilets are just another subtle sign that China is transforming its economy into a more service-oriented one. Beijing is promoting domestic travel, and also making it more enjoyable and convenient for foreigners. According to Travel China Guide, a Chinese travel statistics website, each foreign visitor spends, on average, US$884 per trip to China. That’s 550 percent more than what domestic tourists spend (US$134). So there’s enormous potential for increasing the travel industry’s contribution to China’s economy, which has been slowing. China gets only 29 million foreign visitors each year (not including visitors from Hong Kong and Macau). By comparison, 77 million people visit the U.S. each year. That means foreign visitors to China are equivalent to just 2.2 percent of the Chinese population. In the U.S., it’s 25 percent. So China’s foreign tourist arrivals could quadruple in size — to 116 million a year — and still have plenty of room for growth. Admittedly, there are still things Beijing needs to address before inbound tourism breaks out. For starters, pollution in key cities from having too many cars on the roads turns off tourists from first world countries. There are also horrendous traffic jams in Guangzhou and Beijing… a lack of multi-lingual signs… and Chinese-only-language menus that make it difficult for foreigners to know what they’re ordering. But technology is making travel within China a more pleasurable experience. Smartphone apps can now translate your message to your driver, sales attendant, or airport security within a couple of seconds. An Uber-like ride-sharing service, called Didi, is making travel within cities safe and convenient. English-speaking tour guides are becoming more common. High-speed trains that connect all of China’s major cities, including Shanghai, Beijing, Guangzhou and Shenzhen now operate daily. All of this, including cleaner toilets, is going to further open the country’s tourism industry to growth. One way to gain exposure to this industry is through the PowerShares Golden Dragon China Portfolio (Exchange: New York; ticker: PGJ). PGJ is one of the few exchange-traded funds that holds a substantial amount (10 percent) of its assets in travel-related Chinese stocks like online travel and reservation behemoth CTrip.com and China Lodging Group, one of the largest hotel management companies in the country. Editor’s Note: Today’s piece comes from our friend and colleague at Stansberry Research in the U.S., Brett Eversole. Brett works alongside Dr. Steve Sjuggerud on his True Wealth, True Wealth Systems, True Wealth Opportunities: China and True Wealth Opportunities: Commodities investment newsletters. Find something that’s dirt-cheap… that no one else is interested in owning… and buy it once prices reverse. My colleague Steve Sjuggerud calls this buying what’s “cheap, hated, and in an uptrend.” And it’s a powerful way to invest. Today, I’ll share a market that meets two of these three criteria. It’s record-cheap, as I’ll show. And after a terrible 2018, investors aren’t interested. Similar setups led to 20 percent-plus rallies. We’ll just need to wait for prices to rally. So read on… I’ll tell you one of the simplest ways to put money to work when the time is right. This market has gotten so cheap that it’s one of the best values in the world today. The “trade war” spat between the U.S. and China is mostly to blame for those big losses. And one of the worst-hit markets was Hong Kong. The market fell roughly 24 percent from its peak early last year. Investors have no interest in buying after such a terrible year. And that means right now, this group of stocks is dirt-cheap. 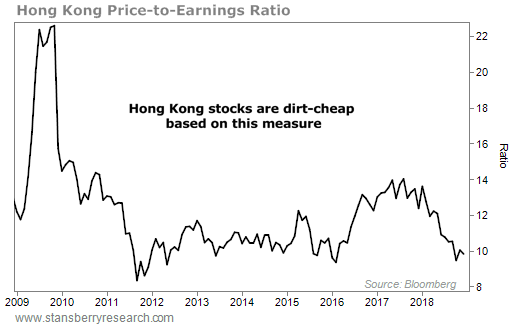 We can see this through the price-to-earnings (P/E) ratio for Hong Kong stocks. The P/E ratio is a measure of valuation. It tells us immediately if a market is cheap (low P/E) or expensive (high P/E). Not only has Hong Kong’s P/E ratio crashed, it’s now bumping into multiyear lows… and some of the lowest levels of the past decade. Investors aren’t buying Hong Kong stocks today. They’re too spooked after a year of poor performance. But these ultra-low valuations mean big gains are likely from here. Hong Kong stocks have only been this cheap two other times since 2008… in 2011 and 2016. Both of those were great times to buy. And you know it’s serious when our customer care director takes time off the phone to record this message on camera. And take 3 minutes to watch this urgent message about what’s happening this coming Monday. After the valuation extreme in 2011, Hong Kong stocks jumped 23 percent over the next year. And in 2016, Hong Kong stocks soared 29 percent after hitting dirt-cheap prices. Now, this sample size is small. But you can look at just about any asset over time and know that buying cheap is a good idea. Hong Kong is no different. The recent sell-off has set up a fantastic opportunity to own Hong Kong stocks. Investors hate them, and they’re near decade lows right now. That’s the “cheap and hated” part of the equation. Unfortunately, the “uptrend” in nowhere to be found. So you’ve got to be patient before taking advantage of this opportunity. I recommend you keep a close eye on the iShares MSCI Hong Kong Fund (EWH). It’s a simple fund that tracks the Hong Kong market. And it’s the easiest way to make this trade. If EWH begins to break out, consider putting money to work. An uptrend is all we need to seize this fantastic moneymaking opportunity. And once prices reverse, history says we could see a strong rally of 20 percent-plus from here. Editor’s note: Right now, Brett’s colleague Steve Sjuggerud is sharing a controversial prediction about the markets. He says over the next year or two, there’s going to be a massive panic – but not the kind of panic most people expect. “If you miss out on this development, it could be a huge, huge source of regret in the months ahead,” he says. Get the full story here.